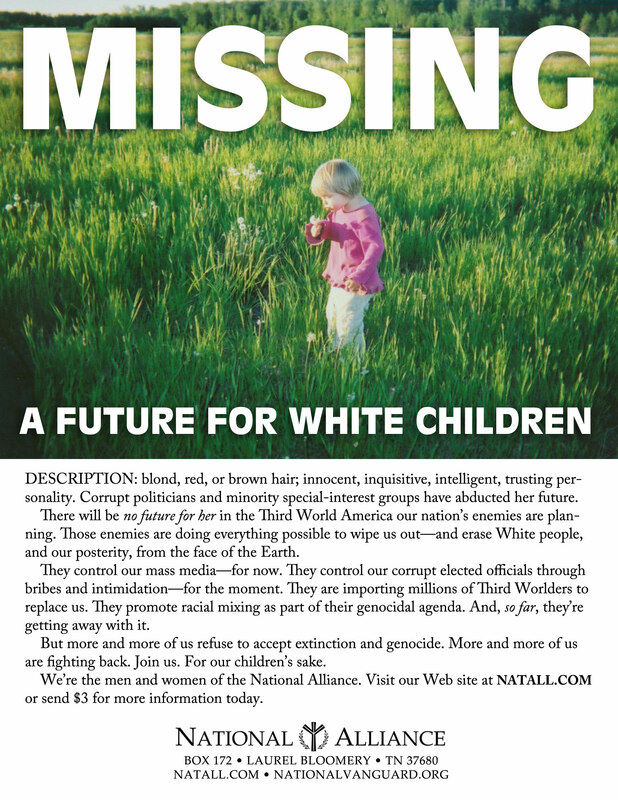 Visit http://natall.com/fliers for a large, printable version of this National Alliance flier. SUPPOSE Saddam Hussein sent a team of Iraqi agents into the United States to shoot down the presidential helicopter on the way to Camp David with George Bush aboard, or to plant a large bomb in the Capitol building, or to poison the water supply for Washington, DC, with the aim of bringing down the Bush administration. What would you call it? Terrorism, right? Suppose George Bush ordered the CIA to send a team of American agents into Iraq to destabilize the government there, or to carry out economic sabotage and generate public unrest, or to assassinate Saddam Hussein. What would you call it? I’d call it embarrassing. Has Saddam Hussein sent anyone into the United States to “take out” George Bush? Not that we know of. Has George Bush ordered anyone into Iraq to “take out” Saddam Hussein? Yes. Mr. Bush has made the order public, and the politicians in the Congress have fallen all over themselves in their rush to second him. So who are the terrorists: Iraqis or Americans? You know, what’s most embarrassing about this situation is not the hypocrisy — the pretense of “fighting terrorism,” the pretense of being opposed to terrorism on principle, while actually engaging in terrorism on a bigger scale than anyone else — what’s most embarrassing is that once again the head Jew has said, “Jump!” and once again an American president has responded, “How high, sir?” It may not be obvious to the yahoos with the little flags on their cars who are sitting around in the American Legion halls and drinking beer, but destabilizing the government of Iraq or assassinating Saddam Hussein and setting up a puppet leader in his place is not something that serves America’s interests. It’s not something that’s worth inviting more terrorist reprisals against Americans. It serves only Israel’s interests, only the interests of the Jews. George Bush understands that. Everyone in the Congress understands that. But they don’t care. When the Jews say, “Jump!” they jump. They all understand that that’s the way to get good press and keep their places at the public trough, and that’s all they care about. The Jews want the U.S. military to wage war against Iraq the way we waged war against Afghanistan, but among the American people there’s not much enthusiasm for another war. So Mr. Bush launches a CIA terror campaign against Iraq in the hope of provoking Iraq to commit terrorist acts in the United States and help him drum up support for a new war. We all thought the Clinton government was embarrassing, but really, what we have now is at least as bad — and at least as dangerous. George Bush’s personal style is different from Bill Clinton’s — so far as we know, Bush doesn’t chase teenaged female interns around the Oval Office — but Bush takes his orders from the same people Clinton did, and so do all of the politicians in the Congress. We can see the growth of this attitude in the growing number of people who have stopped voting. They see that it doesn’t make much difference which party is in power, and they’re disgusted by the whole process. They don’t want to have anything to do with the government. They just want to take care of themselves and their families, and they hope that the government will leave them alone. Unfortunately, it’s not that simple. Unfortunately, the government will not just leave us alone. We cannot afford to just ignore what the government is doing. As I said a minute ago, what the government is doing is not just embarrassing; it’s also dangerous for all of us. It’s dangerous to our freedom and even to our survival. Let’s look first at the danger to our freedom. I’ve talked about this before, but today I have a new example of what is going on in our government at all levels. Last week my organization, the National Alliance, received a letter from a police official in Florida, and I want to read parts of that letter to you. The letter was attached to a copy of a National Alliance leaflet that our members have distributed widely around the country. The leaflet has a photograph of a little White girl about three years old and is headed, “Missing, a future for White children.” Under that heading the text reads, and I quote: “Description: blond, red, or brown hair; fair skin; innocent, inquisitive, intelligent, trusting personality. Corrupt politicians and minority special-interest groups have abducted her future. There will be no future for her in the Third World America that our nation’s enemies are planning. Let’s take back our country and make it great, clean, decent, and beautiful once again. For our children’s sake. The men and women of the National Alliance want you to join in this great, patriotic effort.” That’s the text, and it’s followed by our address, so that people will be able to contact us. Now here’s what the letter that was attached to this leaflet says. It’s on the official letterhead of the St. Pete Beach Police Department, and the letter is from the chief of police. The letter reads, in part: “The enclosed” — he’s referring to our leaflet — “was distributed illegally” — and he has “illegally” in boldface type — “the enclosed was distributed illegally in our area this past Friday night-Saturday morning . . . . I need to make it quite clear that hate mongering is not tolerated in our state, and any future distributions of this illegal nature will result in criminal prosecution of those distributing same. . . . Hatred is hatred — no matter what color or religious preference you are (or hide behind) — and it is illegal. Sincerely, R.F. Kaminskas, Chief of Police.” The letter is dated June 7, and I received it last week. Well, that’s it. Hatred is illegal, says St. Pete Beach Police Chief Kaminskas, and it will be prosecuted. I don’t know whether to laugh or to cry, but I’m more inclined to cry. Certainly, there are dumb cops, even dumb police chiefs, in this country, just as there are dumb people in every profession, and perhaps Chief Kaminskas is just an especially dumb cop. Or perhaps he’s just trying to please his Jewish constituents in St. Pete Beach. St. Pete Beach, by the way, used to be St. Petersburg Beach, but I guess the locals were having trouble spelling the name, so they shortened it. Anyway, I don’t know whether Chief Kaminskas’ problem is stupidity or corruption. I’ve never met the man. But letters like the one he sent me are symptomatic of a very widespread and very dangerous trend in this country. Last week we talked about the rapidly increasing Jewish infiltration and subversion of law-enforcement agencies in the United States. I gave as an example of this the developing relationship between the Federal Bureau of Investigation and the Anti-Defamation League of B’nai B’rith, the most influential Jewish pressure group in America and a group with a long history of affiliation with Jewish organized crime. But this subversion is taking place at all levels, not just in the big Federal secret police agencies in Washington. State police agencies in every state and even uniformed police departments in little one-horse towns like St. Pete Beach also are being subverted. As I just said, I don’t know whether Police Chief Kaminskas is consciously corrupt like FBI Director Mueller, whether Kaminskas is consciously doing what the Jews tell him to do because he knows his job depends on it, or whether he’s just dumb — or maybe just an especially impressionable lemming, who has learned what he thinks he knows about the law from watching too many TV soap operas. Certainly, there is a deplorable tendency in America these days toward touchy-feely law. It used to be that legislators, prosecutors, police officials, and others concerned with the law really were concerned with the letter of the law. Legislators were very careful to be clear and precise in the wording of laws, so that anyone with a reasonable command of English could read the laws and understand what was legal and what was not. But, you know, that’s sort of a male chauvinist way of doing things: far too analytical, far too coldly rigorous. In this increasingly feminized and democratic America, we have developed more of a warm, fuzzy, feel-good approach to law. The attitude today is that bad things ought to be against the law. And what’s bad? Why, everybody knows that from watching television. Racism is bad. Hate is bad. Saying anything against the Jews or the media or the government is bad. If you do bad things or say bad things or have bad thoughts, then you’re a bad person and should be locked up. And it’s not really funny, because if that is Chief Kaminskas’ understanding of the law, he’s quite likely to arrest someone for exercising his constitutionally protected rights in St. Pete Beach, Florida. I’ll guarantee you it won’t be a Black arrested for wearing a Malcolm X T-shirt and handing out flyers demanding reparations for slavery from White people, and it won’t be a Jew arrested for distributing flyers with unkind remarks about Muslims. But it could be a White man or a White woman arrested for distributing flyers expressing concern about a future for White children. People who have a touchy-feely understanding of the law also understand that just because hatred is illegal, not everyone who hates is breaking the law. It really depends on who you are and whom it is that you don’t like. If you watch enough TV you’ll know when hatred is illegal and when it isn’t. You can learn that just by noticing how the characters in the soaps respond to various situations. Presumably, a judge or someone else in the system will have a clearer view of the law, although these days that’s by no means certain. In any case you may end up spending several thousand dollars on lawyers getting out of jail and having the charges against you dismissed. If you have a police chief like R.F. Kaminskas in your community, you may decide that the smart thing to do is just to forget about your constitutional rights and keep your mouth shut. And that is exactly what the folks who gave Chief Kaminskas his understanding of the law are hoping for. It’s not yet illegal to express Politically Incorrect opinions. It’s not yet illegal to hate a member of some officially favored minority or to express your concern for the future of White children. They’re still working on that. But meanwhile almost as good as having laws that actually make those things illegal is to have the lemmings believe that they’re illegal: to have people afraid to exercise their freedom. You know, I’m not a lawyer, but I have a fuzzy notion in the back of my mind that there is a Federal civil rights law somewhere on the books that specifies quite severe penalties for anyone who attempts to interfere with another person’s exercise of a constitutionally protected right, and that threatening or attempting to intimidate is construed as interference. I suspect that if I were the chief of police in some one-horse town and I sent a letter to the head of a Jewish organization threatening to arrest any Jew who distributed Jewish leaflets in my town, the FBI would be all over me in about five minutes, and I would be in very serious trouble. Chief Kaminskas’ letter threatens anyone who tries to exercise his First Amendment rights in St. Pete Beach, Florida, by distributing leaflets expressing a concern for the future of White children. What do you think is the likelihood that the FBI will arrest Chief Kaminskas on a civil rights charge for sending me a threatening letter? I assure you, the likelihood of that is zero to none. Why is that? Why does the FBI vigorously enforce civil rights laws in some cases but not in others? Why are the civil rights of Jews more important than my civil rights? I answered that question last week, but now I’ll answer it again. The same people who have convinced FBI Director Robert Mueller that the new focus of the FBI should be the investigation of “hate crimes” and “extremism” rather than kidnapping, bank robbery, espionage, and other old-fashioned crimes have persuaded the FBI to be Politically Correct in its selective investigation of civil rights violations. Those people, if you remember, are the agents of the Anti-Defamation League of B’nai B’rith: the ADL. But the FBI isn’t the only law-enforcement agency that has been subverted by the ADL. For many years the ADL has worked to politicize and corrupt law enforcement at every level. The ADL arranges expenses-paid trips to Israel for county sheriffs and big-city police chiefs, supposedly to study Israeli methods of law enforcement. More than that, it was the ADL and other Jewish pressure groups that engineered the enactment of the various civil rights laws in the first place, back in the 1960s. Those laws were designed to provide special legal protections for Blacks and other non-Whites, but they were worded so as to appear to protect everyone equally, White and non-White. Most law-enforcement agencies, however, from the FBI all the way down to the St. Pete Beach Police Department, now have learned that the wording isn’t important. What’s important now is to ignore the actual wording and to enforce the laws in a Politically Correct manner. This subversion of law enforcement in the United States — actually the subversion of our whole legal system, including the courts — has been carried out at two levels. At one level the ADL and other powerful Jewish groups apply political pressure and bribes to establish “partnerships” of the sort they have established with the FBI. At another level they use subliminal persuasion through the mass media to convince the general public, including many lower-level law-enforcement people, to interpret the laws their way. So at the top we have the FBI turning 200 Israeli espionage agents loose and still refusing to arrest the known anthrax terrorist who killed five people and terrorized much of the country with his anthrax-infected letters, and at the bottom we have the St. Pete Beach police chief threatening to arrest any White people who distribute Politically Incorrect leaflets in his town: which is to say, leaflets expressing a concern for the future of White children. This subversion is becoming worse rapidly. The ADL and other Jewish organizations are continuing to infiltrate and corrupt police agencies, and the mass media are convincing more and more Americans, perhaps including Chief Kaminskas, that expressing Politically Incorrect ideas is illegal. After enough lemmings have been convinced, the next step will be new laws actually making the expression of Politically Incorrect ideas illegal. And why is this happening to America? In various broadcasts I’ve answered that question in various ways. One answer is that it’s happening because there are people in our country who want to rule us and exploit us, people who believe that they are God’s Chosen People and have a god-given right to rule us and exploit us, and these people understand that in order to rule us they first must take away our freedom, and in order to take away our freedom they must further soften us and confuse us and corrupt us. Another way of answering the question is to point out that life in America has been too easy for too long, and our people have ceased to be vigilant. We have lost our pioneering spirit and have become a nation of consumers and couch potatoes, of mall shoppers and sports fans. 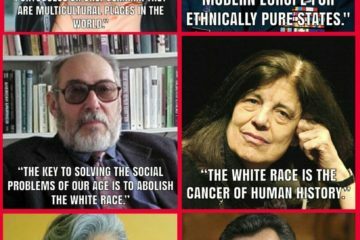 And having ceased to be vigilant, we have left ourselves wide open to exploitation by the worst elements among us: by politicians and Jews, and they simply are doing what comes naturally to them. A more complete answer is a combination of these two answers. We let ourselves become soft, and we relaxed our vigilance, and our relaxation provided an opening for pathogenic elements, and then the pathogenic elements proceeded to do everything they could to reduce our vigilance even further and enlarge the opening. 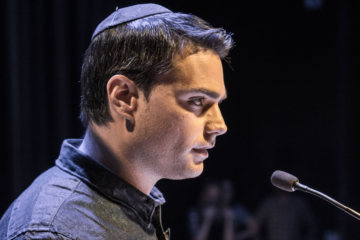 The most dangerous of these elements are the Jews: most dangerous because they are self-conscious and organized and intelligent, and they have seized the most powerful weapon in our society to use against us. They have seized our mass media of news and entertainment. And they have enlisted the collaboration of all the other pathogenic elements in our society. 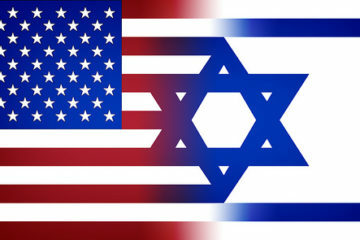 In many of my broadcasts I’ve focused on this all-important fact of Jewish media control, and we can see its central role in what we’ve talked about today: in the corruption of our political leadership to the point that America is used like an errand boy to do the dirty work of the Jews in the Middle East, and in the corruption of our system of laws and law enforcement to the point that the FBI forms a partnership with a criminal organization such as the ADL, and local police officials try to prevent patriotic Americans from exercising their constitutional rights. Well, let me suggest something. Virtually everyone in government today is corrupt and doesn’t really care about what is being done to America, but he does care about being blamed personally for it. The first concern of every bureaucrat is avoiding personal responsibility. If enough people tell FBI Director Robert Mueller that they know why he refuses to arrest the Jewish anthrax terrorist and that they consider his conscious and deliberate decision to foster a partnership between the FBI and a criminal, anti-American Jewish pressure group to be treasonable, perhaps he’ll lose a little sleep. If enough Americans tell him that they are outraged by his release of 200 Israeli espionage agents and that they intend to hold him accountable for his betrayal of America and his violation of his oath of office, perhaps he’ll reflect a bit on his crimes. And if enough people tell St. Pete Beach Police Chief R.F. Kaminskas that they are appalled and angered by his attempt to use his office to deny White Americans their First Amendment right of free speech, perhaps he’ll rethink his position. Jews launched a protest to have the name changed because he was a French Nazi sympathizer. They didn’t even live on the street. How do they know if it was named after that Petain?